Add a little colorful glow to your holiday table with these festive candle stands. This centerpiece craft is so easy and costs very little! 1. First wash your candle jars with some warm soapy water and dry them thoroughly. A little dish soap with warm water easily loosens any stickers with just the light scrub of an old toothbrush. 2. We are going to glue the candle sticks to our glasses to make candle stands. Turn candle jars or drinking glasses upside down on a soft surface. 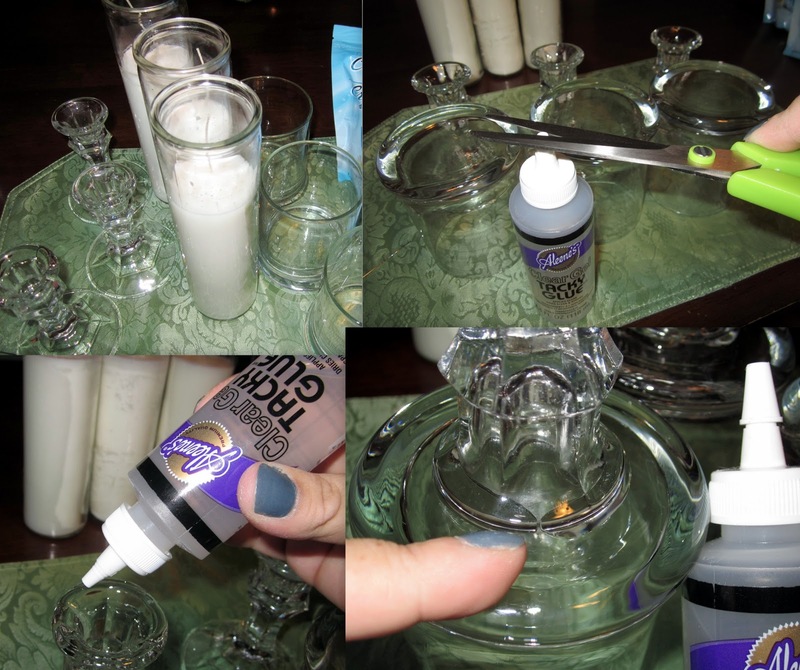 Cut top off of your Aleene's Clear Gel Tacky Glue and place a bead around the top of each candle stick. Do not do a full loop of glue, you want a small space so that air can escape through when you place it on the glass. Find the center of your glass and lightly press the candlestick onto it. Place these aside on a flat surface overnight to dry. This glue will dry very strong! 3. Roll candle along your fabric to check length. Cut strips in different sizes to go around the candle jar. It's best to choose the brightest color for the top, this will be glowing when you light your candle. Arrange the fabric strips in the order you wish to place them before the next step. 4. Place fabric strips in the order you will use them onto a plastic bag, cardboard or sheet or paper. Spray each strip with Aleene's Crystal Clear Tacky Spray. Carefully wrap the each strip around the candle jar. You can layer them right on top of each other. Make sure all seems line up so that they do not stick out like a sore thumb. 5. Tie your ribbon around the top adding in the bell. 6. 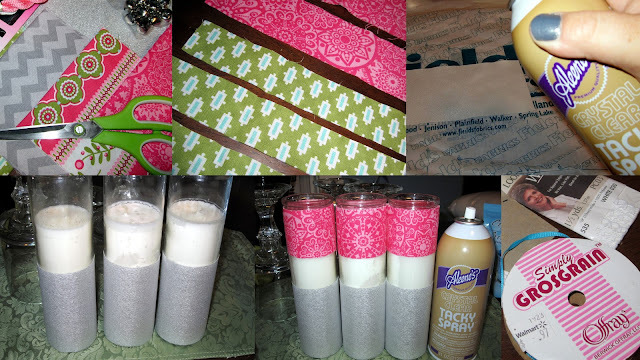 Place fabric wrapped candle jars into candle stands when they are dried. *It would be really pretty to add iridescent beads inside the candle stand jars to surround the base of the fabric covered jars. I didn't have time to go back to the store but that is what I will be adding in later!